Gasthaus-Brauerei Braustelle | Beer Apprentice - Craft Beer News, Reviews, Interviews and Info. What’s up guys? Once again it’s time for another craft beer review. This time I’m going to be trying the Freigeist Ottekolong produced by the Gasthaus-Brauerei Braustelle located in Koln, Germany. This is a brewery that I’ve just recently discovered. As a matter of fact, this is only my second brew from these guys. The website, braustelle.com, is rather limited on information about their beers, so let’s just try it and see for ourselves how it is. This beer came in a 16.9 oz. bottle and it had an ABV of 4.8%. It poured a very cloudy, hazy, golden/yellow color. Some brighter yellow highlights were apparent around the bottom of the glass. The crown was white, fluffy, soft and semi-creamy. It was sized very well and the retention time was excellent. The lacing was outstanding too. This beer had a great presentation for an unfiltered Kolsch. Very attractive. The nose consisted of a lot of grass and grain. It was somewhat musty smelling as well. Some bready hints and a little bit of orange citrus helped out. As I continued to stick my nose in it became overloaded with aromas of wet hay and stale crackers. Hmm. Not the best bouquet I’ve ever experienced. The flavor contained more of a “wheaty” type of taste. A lot of Pilsner-esque malts with a subtle citrus sweetness and day old bread. Again, significant amounts of musty grain, grass and hay. Oh well… it is what it is I guess. Not horrible by any means though. The mouthfeel was medium to medium/thin bodied. Smooth, fairly dry, quite crisp, thirst quenching and refreshing. The carbonation was prime for the style and a befitting amount of flavor was left covering the palate after each gulp of the liquid. Well… this beer was ok I guess. I’m not sure how fresh it was however. It seemed a bit stale in both the taste and the aroma. Although, not anything that I couldn’t work my way through. The beer looked fine, the taste was alright, the mouthfeel was very good and the drinkability was quite good, however the aroma took a little getting used to. I’d like to try it again sometime to see if my interpretation changes with a second tasting. 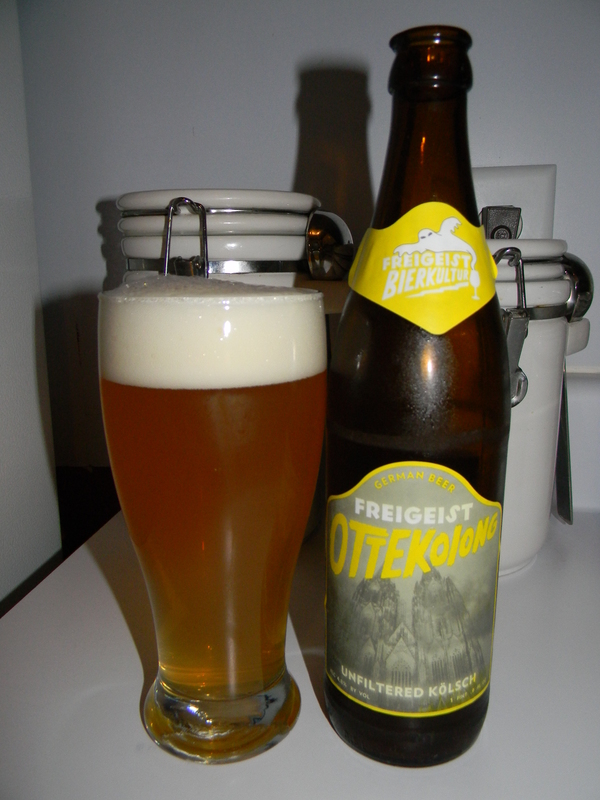 Have any of you guys ever tasted the Freigeist Ottekolong? What did you think of it? Please leave a comment and tell me all about it. I’d like to see if any of you had the same experience I had. Hello everyone. Thanks for checking back in on another craft beer review. For today’s tasting I’m going to be trying the Freigeist Abraxxxas Smoked Lichtenhainer Weisse produced by Gasthaus-Brauerei Braustelle located in Koln, Germany. I can’t recall ever having a beer from these guys before, so I don’t really know what to expect at this point. I couldn’t find any info on the website, braustelle.com, so let’s just go ahead and get the beer in a glass and see how it is. Ready for a sip? I am. This brew came in a 16.9 oz. bottle with an ABV of 6.0%. It poured a cloudy, orange to yellow color with a white cap. The size was sort of small and the texture was a bit soapy and fizzy. The retention time was average and the lacing was only “ok” I thought. The nose released hints of light smoke as well as a light waft of sugar cured country ham. Not only did it smell of smoke, but it also contained fragrances of banana and orange, which I found intriguing in a smoked beer. Underneath I discovered a smell of wheat and grain. I thought the bouquet was nice actually… albeit a bit uncommon. It was somehow balanced and harmonized very well. The taste provided some more of the smoke along with a good shot of orange citrus. The citrus seemed to create a little bit of tartness and sourness. A spicy clove was discovered and the bready/wheat/grain aspects were once again found. Solid. The mouthfeel was medium bodied. Smooth, but crisp and dry. It was actually a bit refreshing. Again, somewhat unique for the style. The carbonation was good and lively and an excellent amount of flavor was left behind after the sips. Well, I found this beer to be very enjoyable and individualistic I’ve never tried a beer quite like this one. 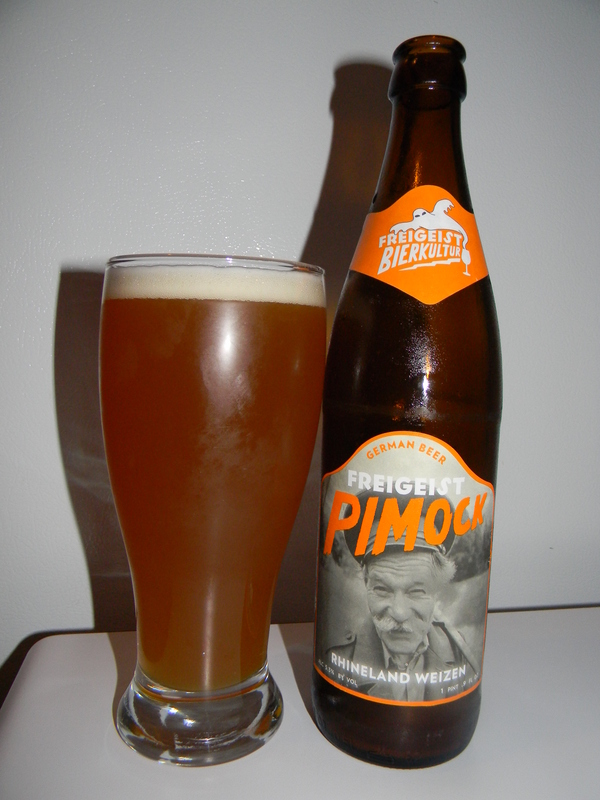 It seemed to be basically a Wheat beer with tinges of smoke. The drinkability was good and it’s definitely worth a try. I would have no problem drinking it again if I had the chance that’s for sure. I would really be interested in trying a few more brews from these guys to see what else they do. 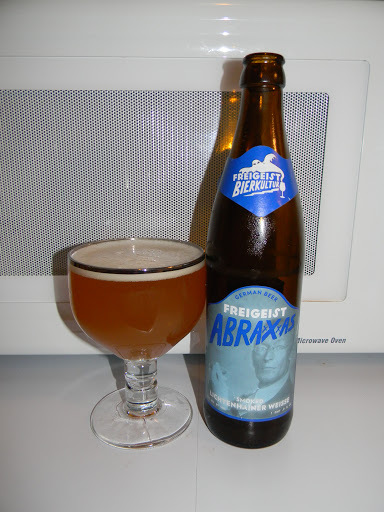 Have you guys ever tried the Freigeist Abraxxxas Smoked Lichtenhainer Weisse? If so, what was your opinion of it? Did you like it? Feel free to leave a comment if you wish and tell me all about it. Thanks for reading everyone. I really appreciate it and I’m grateful for the support of the blog.